every now and then i question whether this blog ought to show more of the 'touristy' mumbai: the famous buildings, beaches, religious spots etc. but then this would become like most other collection of the city's photos. (to be honest, i've already posted a lot of such shots). but the last couple of posts have been very, what shall i say, they've been frames that are quite cut off from their surroundings. could they have been shots from any other city? anyway, with that in mind, i was going through the photos on the computer; but i still didn't want a very postcard photo. so, i settled for this one. 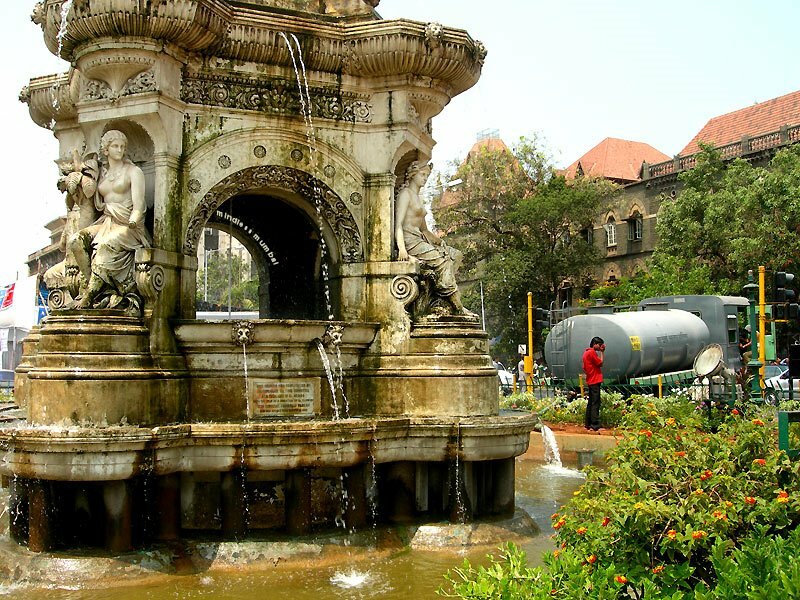 its flora fountain at fort. more about the fountain here. notice the truck in the background on the right? that's refilling water into the fountain on a hot summers day.! shot this some time in may last year. i like such shots where a bit of value-addition to the over-seen-visuals of places / objects is present. i also think that the fragments that i was talking about earlier actually count for the uniqueness of each place. i just don't know what happens when they're framed in complete isolation of their surroundings. what do you'll think? am i making any sense? The moss adds beauty to this fountain! Interesting too is that you photograph the water truck while it fills the fountain up! You have big advantage: do you know shoot. But if I think what leads me to choose this blog in the midst of so many is the same features that I will find on this part of the world and what we can learn, of course we know that there are scenes that are repeated and it is good that they be remember because they exist and they are there. And there are things that are simmilar all over the world but we just notice that if someone shows us that. Great photo of the good old Fountain. I recognized it of course, but it's the best photo of the fountain I've seen so far.